One of the most effective ways to improve patient safety is by using bar-coded wristbands combined with an automated medication administration system such as the SIEMENS Medication Administration Check (MAK). Using a barcode/scanner system, hospitals can drastically reduce and prevent unnecessary medication administration errors, while increasing patient/employee satisfaction and peace of mind. 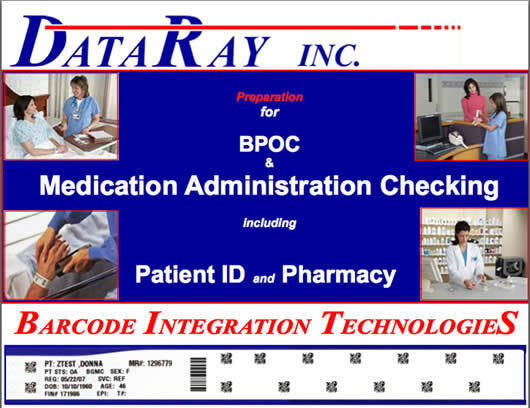 By incorporating DataRay’s bar-coded labels and wristbands with an automated medication administration system, the “Five Rights” can be checked automatically and immediately: right patient, right medication, right dose, right time, and right method of administration. With this method of patient and medication verification, healthcare professionals can be sure that the patient will be identified correctly with accurate information given every time.